With his head down, red eyes, trying to hold his tears, Ronaldo says farewell to his professional soccer player career. As an audio describer, I couldn´t help not to observe the gestures, looks and his manners at that moment, that could show all his awkwardness, some jitter and emotion. 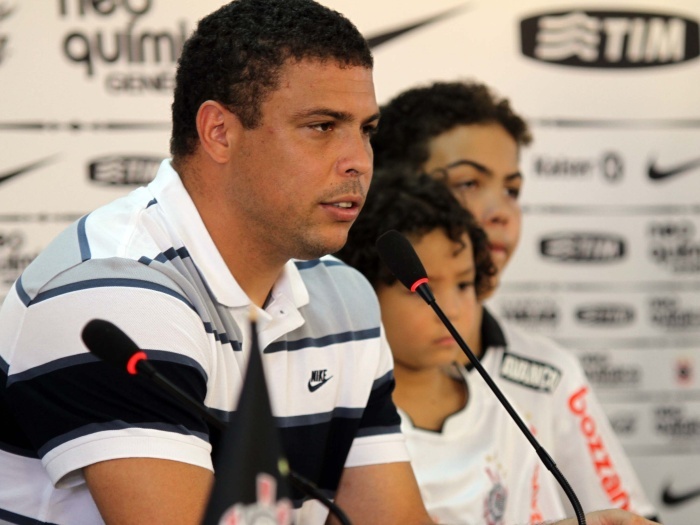 With his unshaved beard, short hair combed forward, wearing a stripped grey, black and white Nike polo shirt and black tall shorts, Ronaldo entered and sat amongst Corinthians Club President and his 2 sons. The youngest boy sat on the older brother´s lap. The Phenomenon passed the hand on the face, dried his forehead several times, annoyed by the heat, itched his cheek, mutton chops, nose and ear, touched his laptop trying, at all costs, to hold his tears that inevitably came down when he thanked the club , not before taking a deep breath in and looking to his children. His younger son, with his black curly hair, slightly hooded eyes and snub nose, being a little fussy, went from his brother´s lap to his father´s. Both, young and old sons, the oldest one already a teenager, also dark with short, black curly hair, were wearing shirts from the soccer club. On the white back wall there were the sponsors logos: Tim, Bozzano, Coca-Cola, Kaiser, Nike and Poderoso Timão (Corinthians Club official Store). In front of him, a crowd of photographers, journalists and cameramen were registering such historical moment for Brazilian football. As well as deaf people need subtitles and sign language interpretation to understand what Ronaldo said in his farewell, blind and low vision people have the right to know the gestures, expressions, information that get to us through the images. Gestures, expressions, looks, clothing, all of this has a meaning that, certainly, completes, enhances and modifies the text that is read or heard.